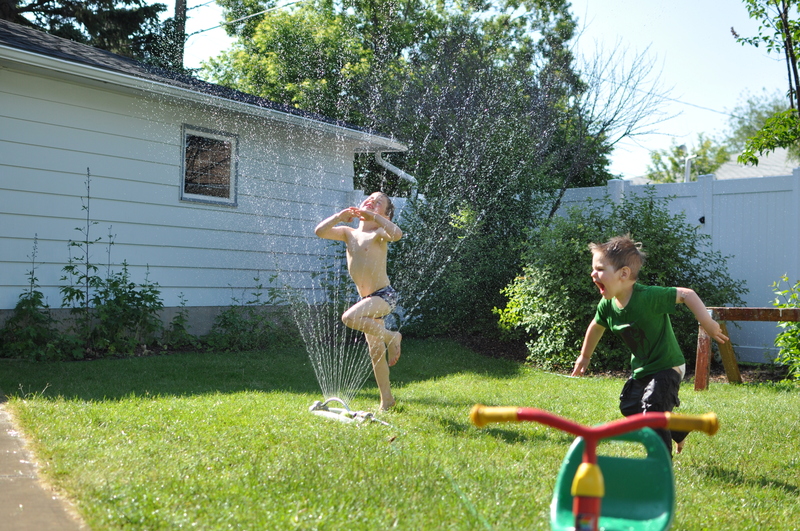 The Johnson boys like nothing better than hanging out in the backyard, playing with water. They drag out empty milk jugs destined for recycling and fill them with water, or fill water bottles with soap or food coloring mixed with water; dumping it on the concrete and each other and who knows what else. ‘Can we play with water,’ they ask nearly every day. And I hardly ever say yes, because they make a serious mess and it always ends with someone crying about someone else dumping water on them. Not to mention the copious amounts of stinky wet clothing abandoned on the outdoor furniture or, worse, on the floor by the back door. So it definitely wasn’t my idea to turn on the sprinkler last Saturday. And not everyone loved it [all of the time]. 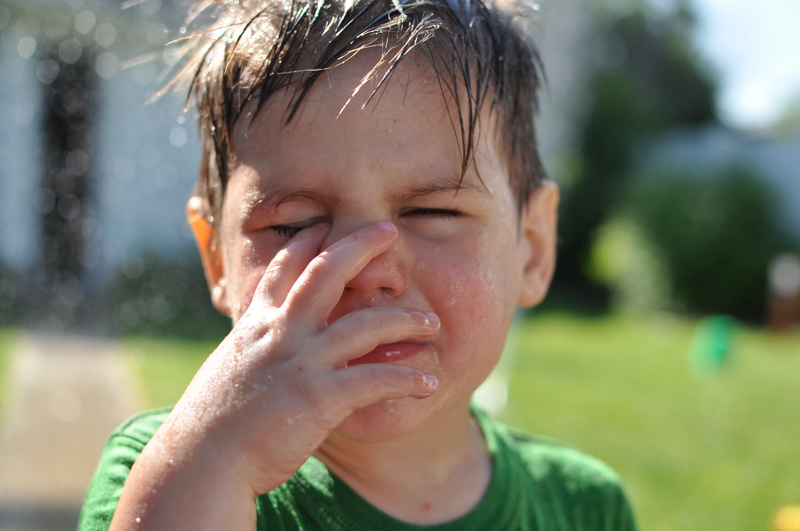 why you ask do I turn on said sprinkler…. well who can turn down a chance at seeing that… pure joy while keeping the grass greener on our side of the fence. that last photo is awesome 🙂 Cheap fun at least, right? 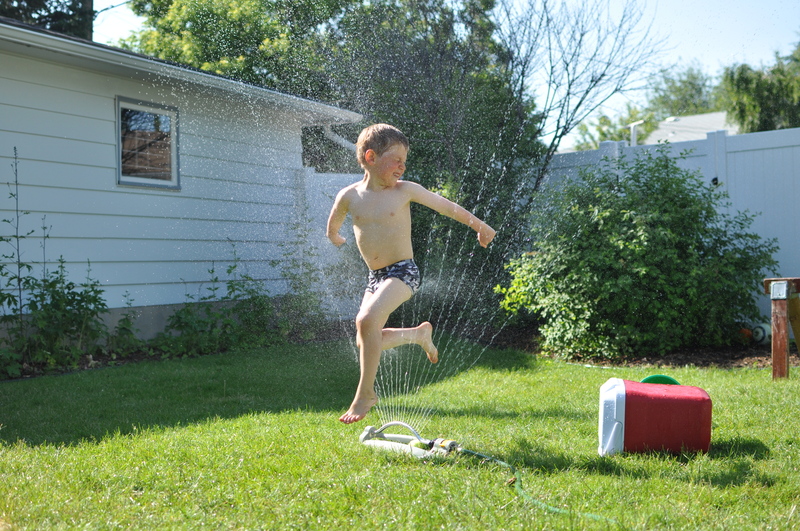 Love those pics of Henners’ joyful sprinkler fun. If you could bottle that kid’s positive energy, you’d make a cajillion dollars. Yes, I said cajillion. Those pics perfectly capture summer fun. I know – his little face reminded me of those cherubic statues in fountains.